Jacking in your day job and deciding to become a freelance designer is not an easy decision to make. That’s why it’s a good idea to have some freelance designer essential advice before taking that leap. There are pros and cons to be aware of, but the benefits can be tremendous. For some it’s the work/life balance that is most attractive. For others it’s the opportunity to earn more money. My personal experience and journey has been pretty good. I started my freelance career by working in the evenings and weekends after work. When I had built up enough regular work I negotiated with my full time employer to work part time. This enabled me to put more energy into building my business and making new connections. After six months I then took the leap of faith and went full time as a freelancer. Don’t get me wrong. It’s not always been plain sailing as sometimes I didn’t know where my next project was coming from. Saying that, I’ve always believed in myself and that has got me through the tough times. So beware it’s not for the faint hearted. But it can be very rewarding and I think I would find it hard to go back and work for someone else full time now. I love the freedom and the variety of work. Plus I’ve learned so many valuable skills working for myself that I’d never have experienced working as an employee. I choose to work at home for the majority of projects. This gives me the lifestyle and rewards that I currently prefer. I have in the past worked onsite within creative agency offices but have at times found this to be complicated and sometimes stressful. So whether you decide to work at home or within an office, I’m sure you can find an option that works for you. Some brave individuals will just leave their full time employment and become a freelance designer without booking in any projects in advance. I would think carefully about this. However a couple of my friends have done this and have managed to forge a successful career, so it can work out. My advice would be to start in your spare time. Work evenings and weekends. This gives you the opportunity to dip your toe in the water without committing yourself. If you decide you don’t like it then you can think of an alternative. If you do decide you do like it, then you can steadily build your work load to a level where you feel comfortable enough to finish your full time employment. This worked for me but you may have a better way. I won’t lie, the transition period is really hard as you’ll be working late nights and some weekends to reach your goal. But it is worth it. It is a great feeling when you know you are going to be your own boss.For most people it is a turning point in their career and they never go back to full time employment. For others it’s just a stop gap until the right permanent job comes along. I must admit I’ve done both. Indesign which is used for designing and laying out print based projects likes leaflets, brochures, posters, adverts, magazines etc. Photoshop which is used for designing with pixels like web pages and creating website assets, banner ads, tweaking photos, creating portfolio mock ups etc. Illustrator which is used for creating vector based designs such as logos, illustrations, icons and sometimes websites. The current setup for Adobe CC is to pay a monthly fee to use their software which is around £45 or $70 per month. So for a self employed creative this is ideal as there is no large cash outlay. You might be able to pickup older versions of the software on CD which how the package was used prior to the online version. This will certainly be cheaper and provides a good solution. You may want to update at some point though as Adobe don’t tend to provide support for older versions of the software. And it may not be compatible with the newer Mac operating system. The Apple Mac is generally the tool of choice for most creatives around the globe. You can still use the Adobe software on a PC and this is a good solution also. I chose to go the Mac route as they are reliable, well built and aren’t open to virus attacks like their counterparts. Unless you are quite wealthy, I wouldn’t suggest you buy a brand new computer though. For the last few years I’ve purchased reconditioned iMacs and they have been fine. They are compact and take up little room. I would suggest you buy the biggest screen you can afford. The 28 inch screen is the one to go for as allows you to open up two windows at the same time. Useful for when working on multiple pages and files. If you want the flexibility of being able to work anywhere, then I’d suggest buying a laptop. This can then be connected to a bigger monitor for when you are working at your desk. If you want to go and work in a coffee shop or go to a meeting, then you can just unplug and off you go. One of the less glamorous sides of becoming a freelancer is keeping your own accounts. By that I mean bookkeeping and tax returns. For some people they decide to undertake these tasks themselves, for others they employ an accountant and bookkeeper to assist. I choose to do the latter and it works fine for me. For my bookkeeping I keep a record of money in and money out and enter details into a spread sheet every month. At the end of the financial year (normally March), I then do my own online self assessment called a tax return. This can be quite complicated but there are plenty of guides to help you with each section of the process. Give a try as it gives you more control and can save you a few quid too. Of course you will also need to organise your own estimates and invoices too, so there is quite a lot of admin involved when working for yourself. On the plus side there are numerous pieces of software out there to help make this whole process easier. I use Billings for estimates and invoicing. It not only allows me to customise templates but it also has a neat desktop timer, so I know exactly how long I spend on projects. Similar software packages are Clearbooks and Kashflow. The simplest route is to signup with recruitment agencies who specialise in freelance contract work. You can find your nearest agency by looking online or in design publications. You will need to brush off your CV and makes sure your portfolio is up-to-date. Once you have been interviewed they will put you in touch with any creative agencies who are looking for a designer. You may be asked to work for a few days or even better you may be offered a two or three month contract. Result! Another route is to contact any creative agencies or PR companies you’d like to work with. Beware though – they probably get approached by dozens of freelancers so the chance of getting employed is going to be tough. Improve your chances by making yourself stand out. Rather than send an email which most people will do, create a clever CV/portfolio pack or perhaps an invite to meet for a coffee, and send this in the post. You’ll have more chance of getting noticed this way. There are numerous websites that post design projects by startups and companies which are a great way to generate some freelance income. You can try People per hour, Elance, or Freelancer. You’ll need to create a profile, upload your graphic design portfolio but then you are good to go. You can then search for jobs that fit your skill base. A lot of the projects have small budgets but it’s a good way in which to build your portfolio and to make connections. If you are persistent, you can make a decent living. Whichever route you choose, enjoy the experience. If you want to become self employed creative, then it can at times be challenging and frustrating. But overall I don’t think I would choose another career. 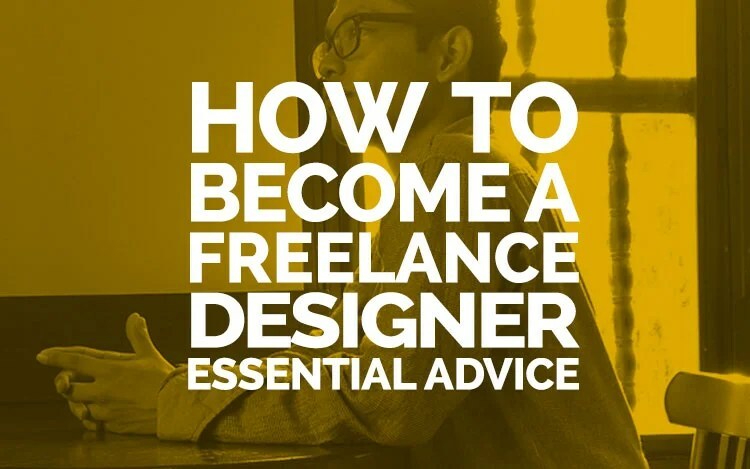 If you enjoyed this article on freelance designer essential advice then please share.